This map contains territory of Egypt, of Israel, of Jordan, of Palestinian Territory, of Saudi Arabia. city Aqaba for Garmin. city Eilat marked. town Tor marked. You can find here town Dhahab download for free. 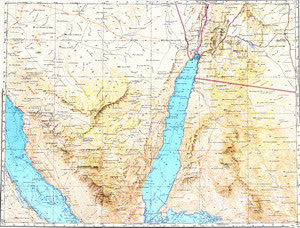 On this map town Al Quwayrah free download. Displayed town Nuwaybi`a marked. Taba marked. Tayyib al Ism download for free. You can find here Maqnah for Garmin. You can find here Haql free download. Displayed `Aynunah download for free. Ash Sharmah presented. Displayed Al Mafraq free download. Displayed Al Khuraybah marked. Displayed Al Humaydah free download. Al Bad` presented. Displayed `Alaqan download for free.